A French Orientalist, born at Figeaci, Lot, 23 December, 1790; died in Paris, 4 March, 1832. He studied Hebrew, Syriac, Ethiopic and Arabic, to which he added later on, Persian, Sanskrit, and in particular Coptic. His main interest was Egyptology, and his main achievement is to have recovered the key for the understanding of the hieroglyphs. In 1807 he presented at the Academy of Grenoble an introduction to a complete description of Egypt under the Pharaohs. The publication of the main work was begun in 1814 under the title "L'Egypte sous les Pharaons"; a work from which only the first two volumes were issued. His efforts to decipher the hieroglyphics began in 1808 and it took him fourteen years to discover the key to the understanding of the Egyptian hieroglyphs. Discovered at Rosette (Raschid) in 1799, by Napoleon's army, the Rosetta Stone is a basalt stone on which was written a text in three languages. He used this text to make the breakthrough in the translation of hieroglyphs. The text of the Rosetta Stone concerns honors bestowed on Ptolemy V Epiphanes in March 196 B.C. in three languages: Demotic, Greek, and hieroglyphs. After praising Ptolemy V Epiphanes, the Rosetta Stone describes the siege of Lycopolis and the king's good deeds for the temple. The text continues with its main purpose, establishing a cult for the king. Champollion observed that some groups of hieroglyphs were circled in what we are calling today cartouches. He assumed that those symbols were describing something important and ... What can be more important than a king or a pharaoh? In the Greek text he found the reference to Ptolemy V Epiphanes and he tried to mach the Greek letters of the name Ptolemy to the symbols in the cartouche. 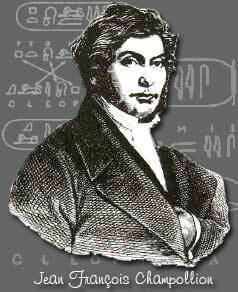 (see the image behind Champollion's picture) In addition to this, Champollion's knowledge of Coptic, the last stage of the ancient Egyptian language written with mostly Greek letters, helped him recognize many ancient Egyptian words in the hieroglyphic part of the text. Champollion finally translated the Rosetta Stone in 1822.